Kevin Harvick became the season's first two-time winner by taking the victory at Martinsville. The one thing I love about short tracks are the fact each one has it’s own personality. Three weeks ago NASCAR was at Bristol, a track that was incredibly fast despite the short 0.533-mile distance around the concrete monster. The second short track on the circuit came on Sunday at the “Paper Clip” known as Martinsville Speedway. Unlike Bristol, this track is mostly asphalt. It is also the shortest track on the circuit, coming in at only 0.526-miles in length. The banking at Martinsville is a short 12 degrees, less than both the banking in the straightaways and the corners at Bristol. However, the biggest difference is how one drives this track. Martinsville has two very short straightaways with u-turn corners. Racing at Martinsville is like driving on the interstate. Majority of the time you’re on the accelerator, but have to slow up to either take an exit or make a move to pass. When something ahead happens, you try to slow up. However, if someone ahead stops short, there is nowhere to go, and a chain-reaction crash occurs. It’s one of my favorite tracks because each car never leaves the way it entered. Not one car takes the checkered flag without either having a ding in the fender, a crushed bumper, or at the least a tire mark on the side. The big difference is when damage happens on the interstate, the drivers involved exchange insurance policies and find out how to get their vehicles repaired. Here, if damage occurs, it’s normal, and teams continue moving forward in getting the best possible finish. Sunday’s race had everything one could expect for a race at Martinsville. It was a record day for lead changes. But, the drivers one would expect to win ended up on the bad end of the results. It mostly was because of luck, or in a few cases mistakes on the part of the driver. In a way that made for a more exciting finish as two of the three drivers that went for the checkered flag were not on anyone’s radar to win all afternoon. Third-place finisher Kyle Busch led the most laps, but fell victim to a move he’s pulled off many times before. The “bump and run” did him in this time as he would fall to his eventual finishing spot. The driver that did the move was someone that is trying to rebound not from one tough season, but actually two. A change of crews has certainly done Hendrick Motorsports some good, as this week the beneficiary was Dale Earnhardt Jr. Earlier this year, with a win at Phoenix, Jeff Gordon showed he still has a lot of fire inside him to win races, and even a championship. Sunday, it was his old crew getting the credit…this time leading Dale Earnhardt Jr. to a runner-up finish. It was his pit crew making a strategy call to get him close to the front, but it was Junior doing the rest. Dale, Jr. taking the lead late in the event had his throng of fans hopeful, and joyous. Even after he lost the lead, the fans still were ecstatic about the finish. 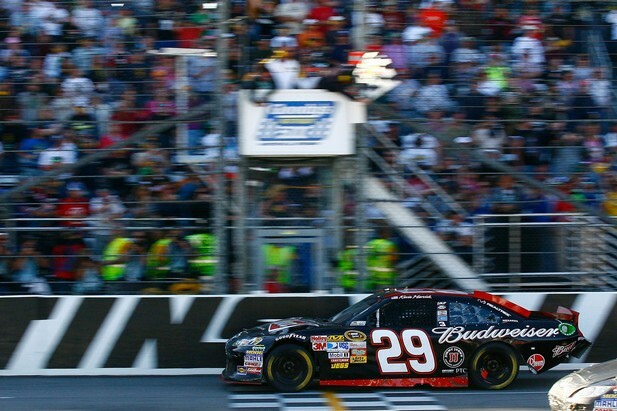 Although, the most hated driver when the checkered flag fell was Kevin Harvick. For two straight weeks, he stayed outside the radar until it mattered the most. This week he didn’t wait until the last lap to make his move. Instead, it was four laps to go when he got under Junior and got the lead. Harvick did that two straight weeks, on two completely different race tracks. The question now becomes, who or what is going to stop “Mr. Where’d He Come From” from completing a trifecta? One question that has been answered is that Harvick is determined to dethrone Johnson from his post as Sprint Cup Champion. His early season success could mean a major celebration at season’s end. CAUTIONS: 11 for 72 laps. Laps: 54-61 (#34 accident-FS), 108-114 (#36 stopped on track), 126-132 (#9, 66 accident-T2), 176-181 (#36 stopped on track), 205-209 (#71 accident-T3), 222-229 (#4, 56 accident-T3; Red Flag-lap 225, 24 Mins. 56 sec. ), 232-238 (#7, 20, 22, 47, 83 accident-T3), 242-247 (#2, 13, 27, 66 accident-T1), 353-359 (#21 slow on track), 372-376 (#39 spin-T4), 467-471 (#78 accident-T2). LEAD CHANGES: 31 among 12 drivers. McMurray 1-31, Kahne 32, Newman 33-34, Hamlin 35-54, Johnson 55-77, Kyle Busch 78-107, Hamlin 108, Johnson 109-123, Hamlin 124-133, Bowyer 134-176, Hamlin 177, Johnson 178-204, Hamlin 205, Bowyer 206-250, Gordon 251-256, Bowyer 257-259, Hamlin 260-314, Kyle Busch 315-320, Gordon 321-324, Newman 325, Allmendinger 326-331, Edwards 332-335, Kyle Busch 336-352, Hamlin 353, Kyle Busch 354-364, Gordon 365-391, Kyle Busch 392-466, Harvick 467, Kyle Busch 468-479, Earnhardt Jr. 480-496, Harvick 497-500. TIME OF RACE: 3 Hrs, 32 Mins, 41 Secs.